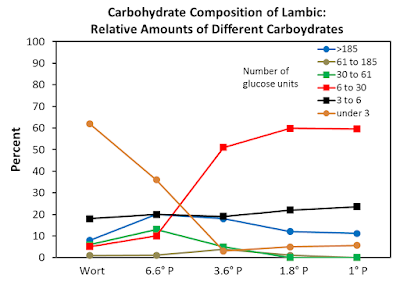 Here are some data on the carbohydrate composition of lambic and how this composition is modified throughout lambic attenuation. The data come from the PhD thesis of H.M. Chandana Shantha Kumara (KU Leuven, Verachtert Group), which focuses on lambic attenuation and identifying the key players responsible for causing the high attenuation of lambic relative to most normal beer. There is some great work in the thesis, especially in showing the microbes and microbe combinations responsible for the attenuation and characterizing the enzymes driving this. Parts of this thesis have been published as scientific papers (here, on identifying super-attenuating microbes, as well as these two papers on characterizing and localizing glucosidases in brett and in Lactobacillus) but I have only seen this specific carbohydrate data in the thesis itself. Many people likely heard something to the effect of "lambic uses a turbid mash, which produces longer chain carbohydrates that help to provide food for organisms like brett over the long fermentation". While I believe this to be true and it makes logical sense, there aren't a lot of studies (other than this one) that provide clear evidence to how that happens. And this is a fairly basic statement. I'm interested in more specifics about turbid mashing so I've been thinking about questions to look into and have been looking for info that might provide a bit more detail. For example, different lambic producers are using different turbid mash schedules. And there were many other schedules used historically (and not always to provide a food source for microbes over a long time period as is the case with lambic). I've written about a couple other schedules in these posts on French bière de garde and low-gravity Belgian beers. So how much do the variations in specific schedules change the final beer? And how much do the variations in turbid mashing change the fermentability of the wort to more normal brewing yeasts? And then what classes of 'unfermentable' material that is carried into the wort from turbid mashing is accessible to the yeasts and bacteria active at 1-2 years in fermenting lambic? This PhD thesis provides some info on that last point. Samples were collected at one brewery from barrels of different ages. My interpretation from the text is that all the samples were collected at one time point and therefore that they are from different brew days and brewing seasons. But this could be a misinterpretation as it isn’t completely clear from the text. If my interpretation is correct, then some of the variability over fermentation could be due to differences in the starting points. However, since the samples are all coming from the same brewery using (presumably) one consistent process, the batch-to-batch variability is likely to be smaller than many of the general trends. 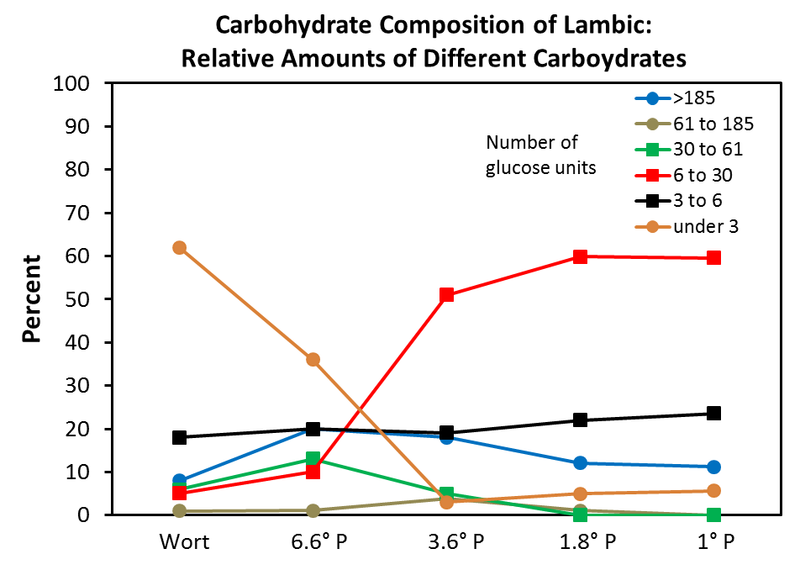 This post shows a couple figures I produced with data presented in chapter 3 of the thesis on carbohydrate composition from lambic of different gravities. 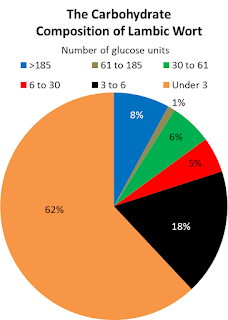 The carbohydrates are broken into groups depending on how many individual sugar units the carbohydrate is composed of. So this ranges from a simple 1 unit sugar like glucose, 2 unit sugars like maltose, up to carbohydrates made up of more than 100 glucose units. This size class breakdown will be the focus of the following discussion. To begin with, I want to say something about the wort before fermentation. The specifics of the turbid mash schedule aren't supplied in the thesis and the brewery is not named. One could infer the brewery based on the data and other info in the thesis but I don't think that is much of a priority given the small amount of information out there about turbid mashing. The composition of carbohydrates as a percentage of the total (by mass) is shown in the figure at right. As with other mashing procedures, the composition is dominated by simpler carbohydrates (1-3 sugar units). And the two smallest groups account for ~80%. But I think it is interesting to note that with this turbid mashed wort, the next largest component is the longest sugar chain grouping. These results are by mass rather than by number of molecules, so it is fewer but larger molecules in this class compared to other classes. But still, in terms of the total number of sugar units present in lambic wort, the third largest fraction is the biggest molecules. I should also note here that the OG of the wort isn’t specified, but I am assuming it is around 13° P as this is where all the standard lambic OG data I’ve seen falls (± ~1° P). The initial half of fermentation (by gravity, not time) is accomplished by fermentation of the smaller chain sugars (<3 and 3-6 units), with no appreciable decrease in the longer chain carbohydrates. This makes sense given the microbial start of lambic fermentation – enterobacteria (in breweries not acidifying wort) and select yeasts (e.g. Kloeckera/Hanseniaspora) that utilize only very simple sugars (frequently only glucose) followed by Saccharomyces. These organisms can’t access the longer chain molecules that remain generally unchanged in the first 50% of attenuation. Carbohydrate composition of fermenting lambic with a full y-axis scale at left and a reduced scale at right. By the time attenuation reaches ~75-80%, the >185 and the 30-61 unit size classes decrease, showing that the microbes responsible for the high attenuation of lambic have started to work on these. Interestingly, at this point, the 6-30 unit class concentration increases and the carbohydrate concentration of this class does not drop below its initial level for the remainder of fermentation. The persistence of this intermediate class is a pretty novel finding. Dr. Shantha Kumara interprets this as the larger size classes being first cleaved by endo-glucosidases (enzymes acting in the middle of the molecules) to smaller sized molecules including the 6-30 unit range. These smaller ranges are then processed by the cells (either extracellularly and then fermented or internalized directly). 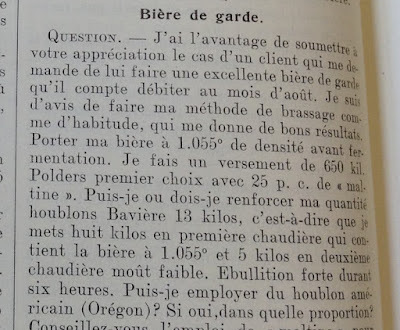 So the large carbohydrates are made available by first being broken down extracellularly, leading to a net 6-30 unit carbohydrate production in the lambic, followed by a consistently elevated (though decreasing) 6-30 unit class throughout fermentation. If this all sounds too complicated, you can picture the different carbohydrate pools as buckets of water with holes in the bottom. Water is draining from the buckets through these holes (carbohydrates are broken down into smaller molecules and/or fermented). For the 6-30 unit size class, you are also adding water (the larger molecules are broken down into 6-30 unit-sized carbohydrates) such that the total level of water in this bucket is rising even though some is still draining out. Eventually you reach a point where you are adding the water more slowly because there is not much left to add (the large size classes have fewer molecules to be broken down to the 6-30 size class) such that the water level in the 6-30 unit bucket can fall again. Percentage of different carbohydrate size classes in fermenting lambic. As the lambic reaches final gravity (in this case testing stopped at 1° P, though note that many lambics don’t finish this low), the two largest remaining fractions are the 6-30 unit and the 3-6 unit carbohydrates. I found this quite surprising as I would have expected the more simple molecules to be processed more easily. So perhaps there is still a bit of fermentation going on at this point. Either way, the 6-30 unit class is maintained in appreciable concentration throughout the fermentation while larger molecules are more completely used up. The result, in final or near final gravity lambic, is that the residual carbohydrates are dominated by 3-30 unit carbohydrates while the shorter and longer chain molecules are more completely removed. The same trend can be seen in the data when looking at the relative carbohydrate composition, where the percentage of the 6-30 unit class increases from ~1/2 attenuation onward and the percentage of the 3-6 unit group remains roughly constant or rises slightly. So at the final gravity point measured here (1° P) these two size classes are the most prominent. In contrast to this, there are basically no carbohydrates left in the 30-185 size classes. The >185 size class counts for a similar percentage in wort as in the final lambic, so there is still something left in this class at the end of these measurements. But the non-normalized data show that there was clear removal of this size fraction during fermentation. This study did a great job of showing how lambic wort from one producer using one turbid mash schedule was attenuated over the course of fermentation. But I would be interested to know how this might differ with other producers. What if a different turbid mash schedules produced more long chain carbohydrates? Would this influence the FG? We know that a good number of lambics do not attenuate as far as 1° P, and this is driven by microbes and/or hot side process. The degree to which the microbes in this study were able to access the longest chain carbohydrates suggests that mashing to produce even more of this size class would not result in much of a change in the FG. And therefore that the differences in FGs among different lambics might be due in large part to the capabilities of the different microbes. This interpretation fits with other lambic attenuation data that I’ve seen (though expanding on that is a topic for another post). Additionally, if this were the case, it would highlight the inter-producer diversity of lambic microbes. None of the above discussion of how different turbid mash procedures may influence beer addresses flavor production. Of course there is the flavor of the wort, which one might assume could vary by different mashing process given that turbid mashed wort tastes different from infusion mashed wort. But there might also be differences in microbial flavor development if the composition of more complex molecules was altered. So there are still plenty of questions to address here. Finally, I’m interested in more info on turbid mashes compared to conventional mashing. There is unfortunately not quantitative data in this thesis comparing the carbohydrate composition of lambic wort to normal beer wort. But qualitatively, there is a figure showing that lambic has higher levels of carbohydrates with 4 and more sugar units than lager beer. This is especially the case for longer chain compounds that likely have tens to hundreds of sugar units. That is unsurprising, but it would be interesting to have a more quantitative measure to compare. I suspect info like this is out there somewhere and maybe I'll track some down and work it into an update of this. Really nice review of the thesis. I wonder if the apparent maintenance of the 6-30 unit sugars as the beer reaches terminal gravity is simply a product of the physics of the solution. By this I mean, as the beer approaches terminal gravity, there is less and less probability a sugar will be intercepted by a yeast. As we know they aren't motile, so presumably as the yeast settle in the barrel they drop out, and the opportunity to gain access to a dissolved sugar would decrease even more than if they were in a uniform suspension, at least I think it would, I'm not very well versed on the fluid dynamics of sugars in water. So as much as strain population would affect FG, perhaps flocculation, or some other physical phenomenon, would as well. Then again, I may be totally wrong and this comment is an exercise in futility. but why would the yeast falling out affect the 6-30 chain more than the <6 groups? It's true they aren't motile, but keep in mind that a current is produced by fermentation. This disperses the yeast and bacteria throughout the solution. Also, these particular microbes are likely well-adjusted to a turbid mash, since they are primarily residents of the room they are in, and attack their respective sugars accordingly. I agree about fermentation dispersion of the microorganisms, but wouldn't after a time, the rate of fermentation drop so low the organisms drop out. If you look at the composition of sugars below 3 brix, there is basically minimal change. This detail is why I proposed the access as a reason for the higher levels of the 3-60 sugars. Totally agree with you about the organisms being acclimated to the beer style. I'm just proposing a hypothesis as to a possible reason behind the seemingly surprising sugar composition post fermentation completion. Good discussion and thanks all for sharing your thoughts! And sorry for my delay on replying. Anyway, yeah, it is possible that flocculation is influencing FG. I've seen circumstantial evidence to support both sides here, but here are some additional ideas. If sugar utilization were diffusion-limited (controlled by the chances of a molecule hitting a cell), then you would expect it to favor removal of the molecules of higher concentrations. But in the last three sampling points you see the opposite trend (slight increases in 3-6 and 6-30 while >185 decreases). Additionally I think these sorts of concentrations (g/L) are well above diffusion-limited levels. Also, if settling out was the driver for FG then you would expect the addition of new microbes (but of the same nature as the previous) to drive the FG lower. So one could compare the FG of lambic v the FG of bottled gueuze, which has the microbes present in younger lambic mixed in. The only place where I've seen data to address this is at Cantillon, where the FG on gueuze is fairly high and is in line with their oude lambic (compare gueuze v grand cru here: http://www.horscategoriebrewing.com/2017/03/lambic-characteristics-fg-and-ibus-in.html). So my guess is that flocculation may not be the primary factor. But I wouldn't rule out the possibility that it plays a role. Yeah, totally not sure about the concentration where diffusion limit become significant. Really good right up on the other post as well! Just found this blog, and loving the scientific approach to brewing and the history. I'll be reading regularly now. Thanks! Glad you you've found the blog and are liking it. Diffusion limitation comes up in my research field a bit, but I've not had to factor it into my work specifically. So this is just some guess-work and may not translate directly to beer. The sorts of situations where diffusion limitation becomes an issue for cells in the ocean are when concentrations generally are on the order of a billion times lower than these sugar concentrations. So even if there is something different going on, there is a lot of wiggle room before approaching g/l. Hi! I was so excited to find this blog, this thesis was written by my father, I showed it to him! He is very happy see interest in his work! Cool, thanks Sonali! That's great. Thanks for showing this to your father. And tell him thanks for the great work he did for his PhD!